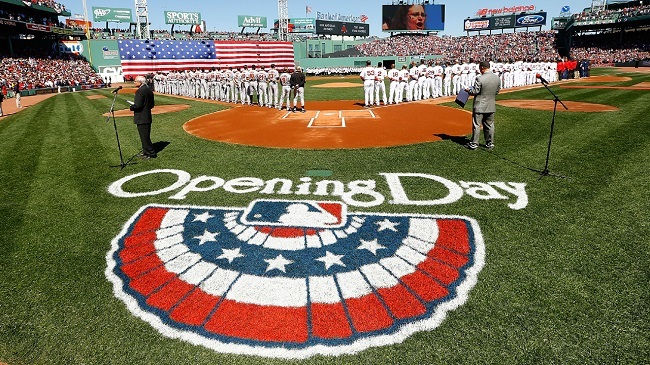 Countdown to Opening Day: Is Your Baseball Infield as Ready as Your Players? It’s the countdown to opening day next week. Go Giants! And Dodgers, and Nats, Pirates and our hometown Reno Aces. I think I’ve covered all the favorite teams here in our office. We’re a diehard bunch when it comes to baseball, and softball, too, as we have a world series of softball player on our marketing team. We love everything about baseball – talking about the players, the drama, the start of great weather, the food, and our favorite part - our infield baseball products! We absolutely love to see our BallGame Changer and PlayBall! products in action on those MLB, minor league, college and high school baseball and softball infields. These new baseball infield products comprise the complete line of our Groundskeeper’s Choice 100% natural, high-performance super calcined clay solutions. “BallGame Changer with KT3 is a revolutionary new clay product,” said Kitchens. “KT3 is a surface technology that changes how the BallGame Changer product interacts with water. You can apply the normal amount of water and conditioner with BallGame Changer as you use today and maintain a higher moisture level for nine innings, reducing dust and additional maintenance factors,” he added. PlayBall! comes in a drying agent, mound clay, and conditioner. All of the Groundskeeper’s Choice infield products are designed to last longer, reduce dust and water usage, and provide better traction for safer playability. To learn more about BallGame Changer and Play Ball!, click here.